By the time I pulled my car in front of the barn, Gene Fletcher had already trimmed three of Sam’s hooves. The farrier finished up and placed the big Belgian’s hoof squarely back on the ground. He moved on to trim up Myrtle, the other Belgian in Ballentine’s barn. Her hooves were two to three times bigger than the average riding horse. One misstep and she could easily break a few toes. I watched as Gene skillfully worked on the huge mare, trimming, filing and balancing her hooves. “How’s everything going for you?” I asked. “Not too bad…busy,” replied Gene. “Well, I’m going to be a guest speaker this summer at a rodeo in Benton, PA. I’m speaking about a non-profit organization called Hunters for Healing,” said Gene. “They take disabled veterans out hunting to help them heal spiritually. They also provide hunting and fishing equipment and mentors to work one on one with the veteran. I’ve been involved with them for a year. I went pheasant and turkey hunting. Some good memories, next year they are organizing a bear hunt in Canada. I live close to their headquarters and hope to become a mentor for other post 9/11 disabled veterans,” said Gene. Hunters for Healing was founded in February of 2009 to help wounded soldiers returning from military service in Iraq and Afghanistan. The veterans participate in a variety of outdoor programs including hunter safety, clay target shooting, pheasant and small game hunting, fishing and camping. Currently, events are in Northeastern Pennsylvania. The programs present challenges to veterans and provide social interaction with other people to help veterans transition to civilian life. Gene moved on to the next horse, he had 4 horses to trim and 1 to shoe. Quickly, he trimmed CJ and Pepper’s hooves moving on to the last horse. Jupiter started out ok, but had a habit of pulling away towards the end of the shoeing job. Gene hammered in the first nails, secured the shoe and crimped off the sharp nail ends. “It looks like being a farrier could be a dangerous job,” I said. “Being a farrier isn’t that dangerous. If the horse pulls his foot out from my hand while I’m shoeing him, the nail causes a problem. Last year, Jupiter did that and the nail ripped a hole straight down the leg of my jeans,” he said. “Well at least you weren’t injured,” I said. “Not that time, but I have had my calf muscle cut open from a sharp nail. That’s why it’s important for horse owners to work with their horse’s and get the animals used to picking up their feet. It’s when the horse starts acting like an idiot that things can get hazardous,” he said. Gene shod Jupiter. He gathered his tools and returned them to the truck. The morning gathered heat creating a hazy, humid grayness to the sky. “Do you still have your on-line course?” I asked. “I’m still doing the course through Alfred State University. 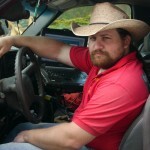 I’ve been thinking about doing a horse clinic, but I have to balance my time with the farrier business,” replied Gene. “I went to a horse training clinic at Meadowgate a few years ago. It was interesting,” I said. “If you’re interested, I’m working with a woman and her horse in Burlington, PA. You could come down and watch,” he said. “I just have to check with the woman to see if it’s ok with her. I’ll call you,” he said. 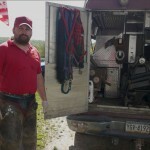 Gene pulled his farrier truck onto Murray Creek Road and headed south for another job. Later that day, I received a phone call from Gene; it was ok for me to come to the training session. I circled May 24th and wrote ‘2 PM meet Gene’ on my calendar. A few days later, I met Deb Yoder and her beautiful Paint, Willow. But that story is for another day and another blog – watch for ‘Training Session with Gene Fletcher – Lunging’ to be released on June 27th. This entry was posted in Uncategorized and tagged Ballentine's Horse Heaven, Farrier and Horse Trainer Gene Fletcher, Hunters for Healing, shoeing and trimming horses. Bookmark the permalink.